let me, let me, get what I want. 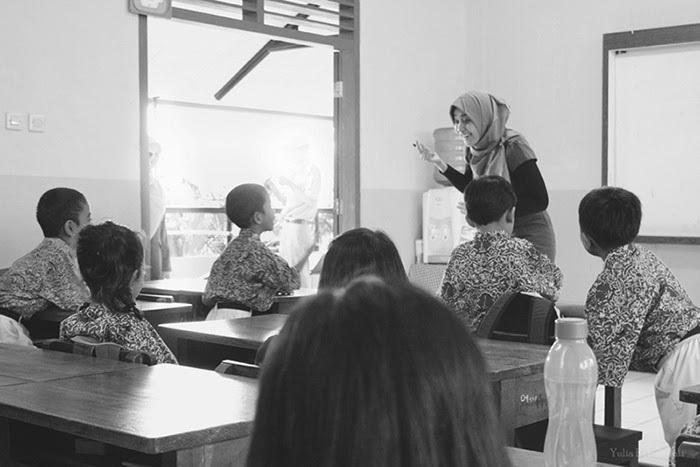 Kelas Inspirasi (Inspirational Class) is a part of Indonesia Mengajar program which offers an opportunity for professionals to take one day off from work (cuti) and being a teacher, share inspirations for elementary schools children about their profession. To let the children knows that there are so many kind of chance in life that they can involve and take part at. 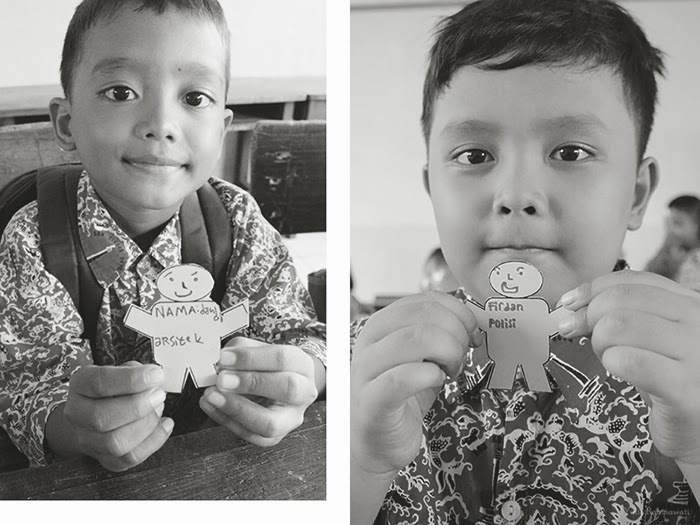 Kelas Inspirasi would like the children knows that the world is so big and waiting for them. 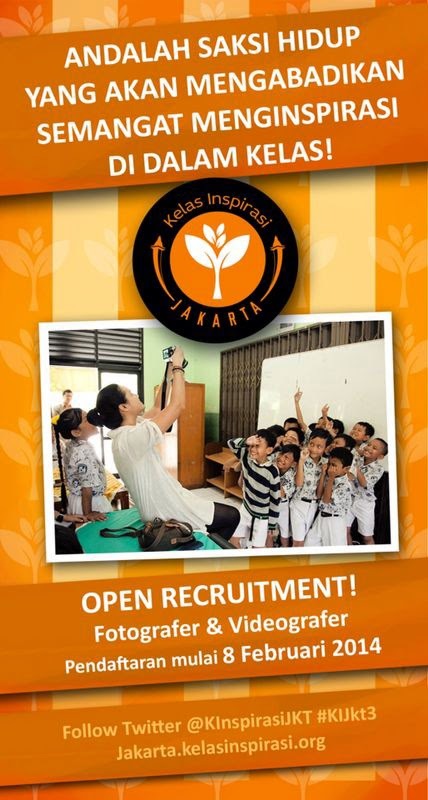 Now Kelas Inspirasi spread not only at Jakarta, but also Jogja, Palembang, Makassar, etc. Why elementary school children to be inspired? 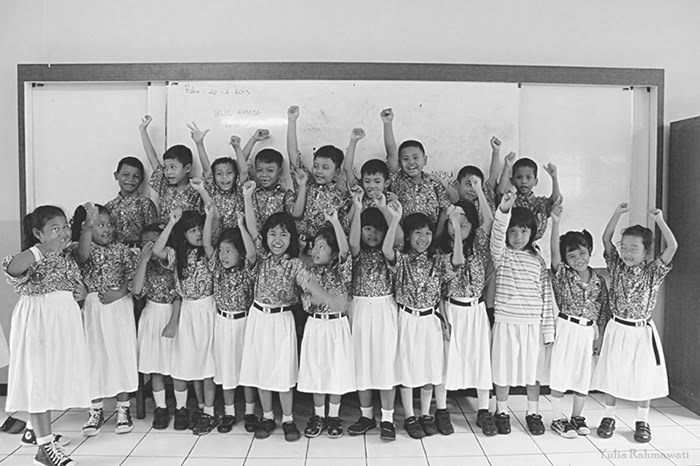 Because the mission of Kelas Inspirasi is to encourage young children to have a dream, and go for it. No matter what is they dream. Some children dreaming of being a teacher, artist, scientist, pilot, doctor, soccer player, or farmer, or mechanic, even parking attendants. Children at elementary school age still at their dreaming stage and they are conscious and logic enough to be inspired. All of the selected one-day-inspiring teacher would not teaching students daily lessons such as maths, Bahasa, religion, science, or sport. 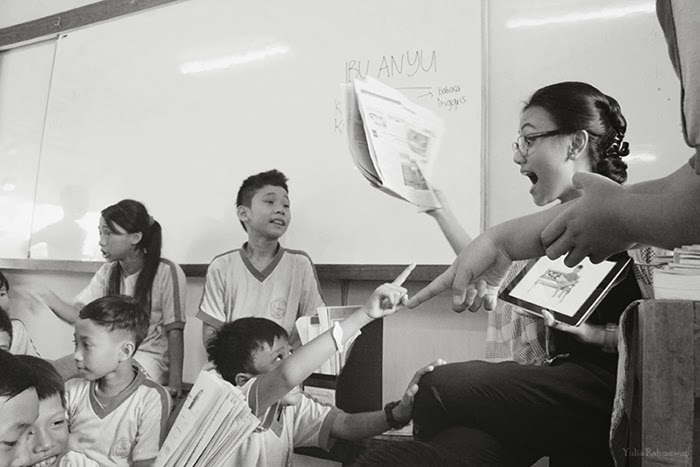 These inspiring teacher will demonstrate their profession with their own way so the children will understand about their profession, to attract the children, to inspire them. This will be a great experience to be a teacher, and eventhough most of teachers says that was not easy to teach (Oh yes, now they already know how does it feel to be a teacher), but being a teacher at Kelas Inspirasi giving addiction to joint this action again and again. All the energy, tricks, equipment, models, jokes, everything, to attract and to explain their profession to the children. 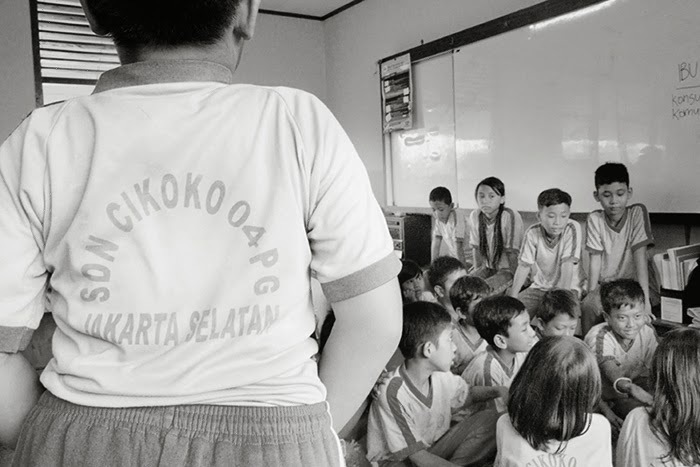 Me myself participated as a volunteer photographer at Kelas Inspirasi 2 Jakarta, someday I would love to try being a "pengajar" (teacher) at Kelas Inspirasi because one of the requirements of being teacher at Kelas Inspirasi is having at least 2 years experience at current job. 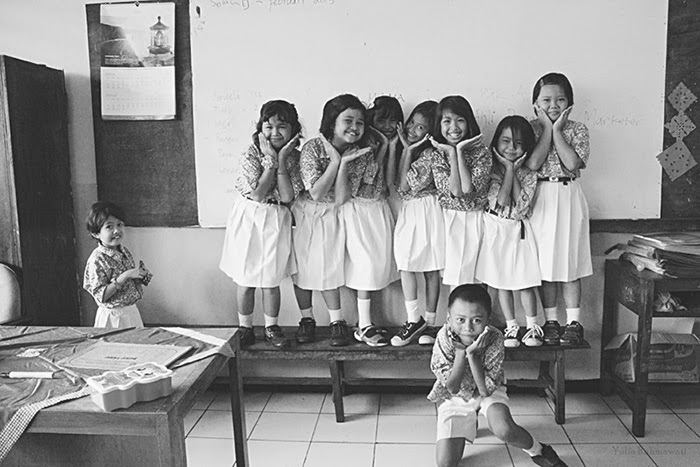 Being a photographer does not mean I did not having fun at Kelas Inspirasi. 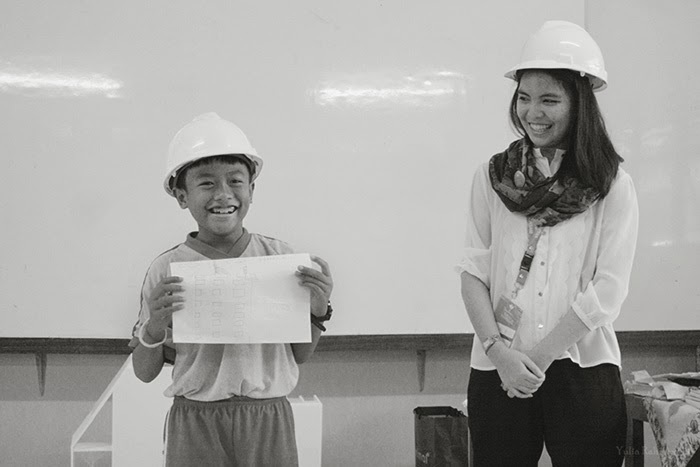 I learned a lot form the teachers, from the children, and from all the stakeholders at the school I documented. Umh, at the end I still believe that it is not only us who inspire the children, but we did inspired by them as well. Oh, I can't help myself seeing all those little hands raising up to answer the question, even though some of them looked a bit shy at the first. Also seeing their smiles, laugh, and looks so interesting with my camera. So many of them try to ask me to walk around their schools, introduced their canteen, classes, until toilet, and looked so proud of holding my hands and guided me, while their friends looking at them. I taught them how to play with my camera at their break up time, and I felt so grateful that they was really excited to take picture of their friend and couldn't wait for they turn to hold my camera. The most happiest moment in my life that day was when I read all the dreams of the children. I felt happy that some of them still stick with their dream and my favourite dream was "botanist". I did know where did she get that dream from. 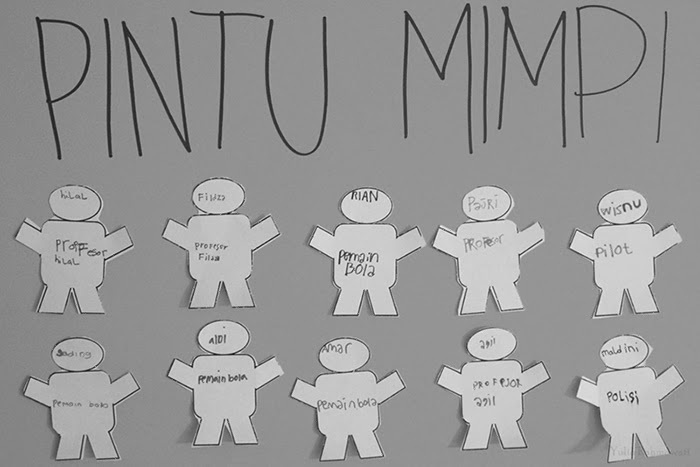 Unfortunately I did not met the girl who wrote that dream on her "Pintu Mimpi"
Thank you Kelas Inspirasi 2 for a-one-day-full-of-inspiration in my life. I will definetely joint Kelas Inspirasi 3 as photographer. Wish me luck, hope I'll be selected again to document this amazing event and feel free to joint Kelas Inspirasi as teacher here and as photographer & videographer here. More words: amazing, moving, funny kids.